The McKenzie is an attractive machine. I particularly like unusual the design of the frame. 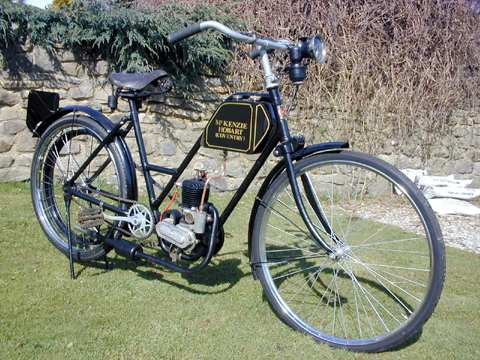 It was not manufactured for long – by the mid-twenties you could buy a car for £100 and there was extreme competition among manufacturers of lightweight motorcycles. So these days the model is quite rare. 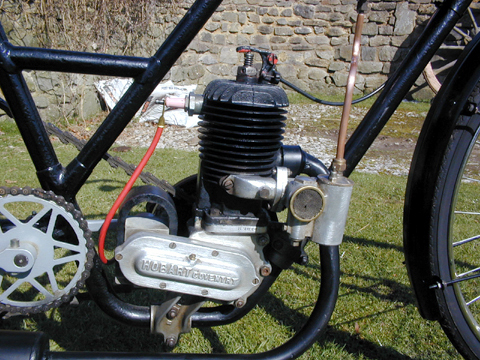 This McKenzie is in good condition, thought the engine has not been run for quite some time. 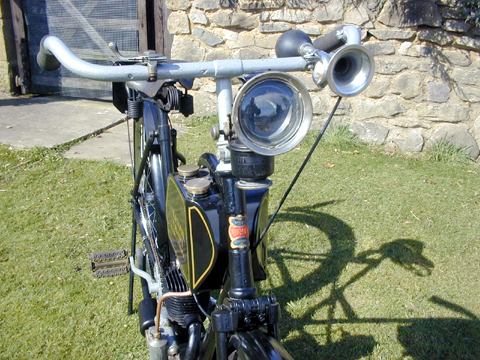 So I’m not sure how much tinkering will be required to put it on the road. 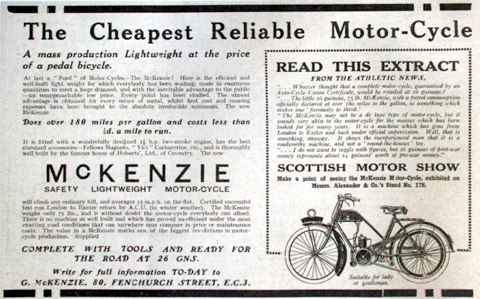 Following World War One Mr G McKenzie marketed an “ultralight motor cycle” as the type was then known. 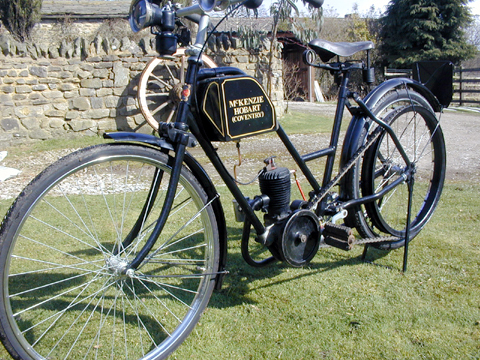 From an engineering point of view, there does not appear to have been anything new about the McKenzie design, the pre-first world war Lady’s Humber in the Coventry Museum of Transport being virtually identical. 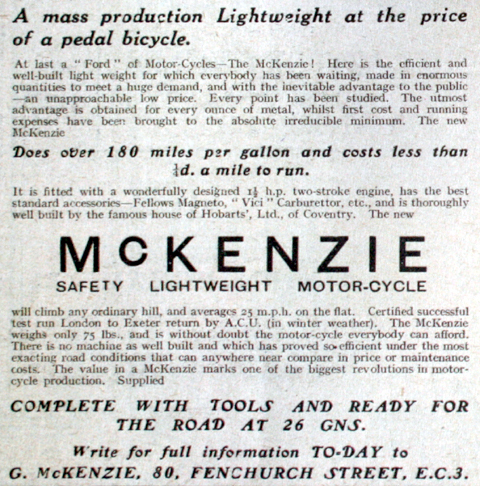 McKenzie planned to sell his bikes through franchised cycle shops, and bring cheap motorised transport to the masses. 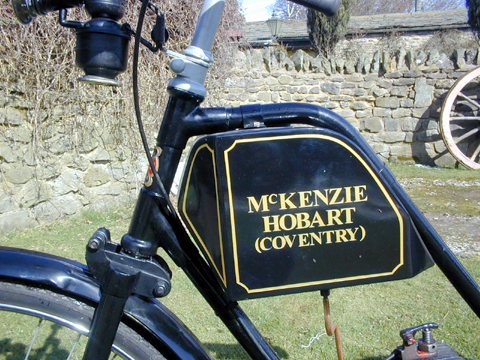 The bike itself was made by the Hobart Cycle Co Ltd of Coventry. 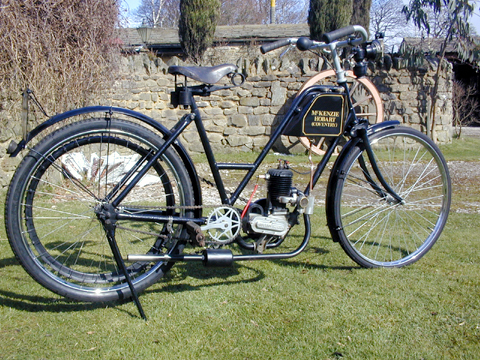 The early model had an open frame with solid rear end and spring front forks. 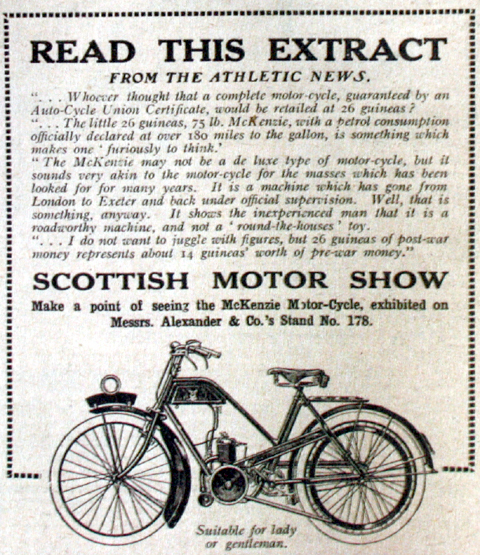 It’s interesting to note that, though we now describe all open cycles as ‘Ladies Models,’ McKenzie actually marketed this first design as ‘suitable for lady or gentleman’ as only one model was sold. If you’ve wondered why ladies bicycles of the 1910’s and 1920’s were usually so large, it’s because women were not their only users – they were also sold as ‘Ecclesiastical Cycles,’ to be used by priests, whose cassocks made gents models unsuitable. The deflector type piston is cast iron with three rings in two grooves: two in one groove at the top. It has plain bronze bushes for small end, big end and mains. The crankshaft is most unusual, being in two parts. 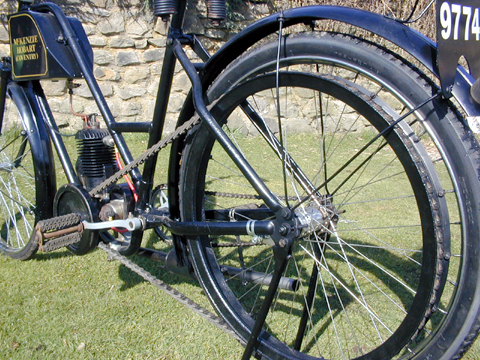 The left hand part drives a large flywheel with integral belt pulley, which, by means of a leather belt, drives the back wheel. The right hand bob weight has an oblong slot that engages with flats on the end of the crank-pin, thus drive is taken to a 3 gear train that operates the ‘Baby Fellows’ magneto that is mounted behind the engine.